Newly renovated, The Inn at Haines combines historical, vintage charm with modern amenities. Lovely antiques but luxurious pillow top beds, plush linens and robes and free wifi. Start out your morning with strong coffee, fresh fruit, local sourdough bagels and bread, homemade jams, granola, and other goodness. Newly renovated, The Inn at Haines combines historical, vintage charm with modern amenities. Lovely antiques but luxurious pillow top beds, plush linens and robes and free wifi. Start out your morning with strong coffee, fresh fruit, locally made sourdough bagels and bread, homemade jams, granola, and other goodness. The rooms at The Inn may have been built in 1912 but you will be embraced by luxurious plush beds, down pillows and comforters (allergy free alternatives on request), and crisp 600 count cotton linens. Slip into comfort after a day of adventuring the Chilkat Valley or grab your coffee and stay in bed late in the morning! All rooms share several updated bathroom facilities. Facilities are not crowded and easily accessed from all rooms. Hot water is plentiful, plush towels, robes and locally made soaps are provided. Shower rooms are private and separate from washrooms, and the facilities are cleaned several times a day. Gentle, pure ingredient shampoos are provided. Breakfast is always included at you stay at The Inn. Start your morning off with fresh brewed coffee or tea and a European style breakfast with local made sourdough toast, homemade jams from local wild fruit, fruit, yogurt, granola and soft boiled eggs. Dietary replacements are always provided on request. Guest are welcome to store treats, alcoholic beverages in the guest fridge. The main kitchen is not shared with guests. Guests have access to all the comforts of the house with a sunny enclosed porch overlooking the water and downtown, a big fenced in yard for bbq's and socializing or just soaking up that Southeast Alaska sunshine! Relax and read a book in the family room or get to know other guests over breakfast. 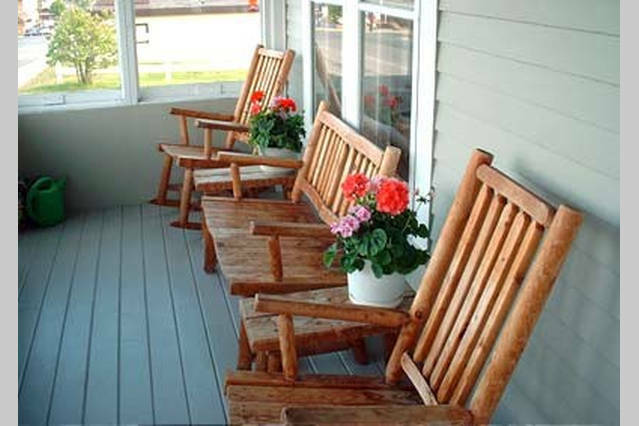 Enjoy a glass of wine on the deck and make yourself at home!